In a 10-part series Robert Gray, President of Insightlink Communications identifies the top 10 drivers of employee engagement according to Survey of the American Workforce, a recently completed national survey conducted annually by Insightlink. Enjoying what you do was found to be the number one driver and the single most important motivator of job satisfaction in the US today. The second most important driver is reciprocity. Match your commitment to employees with that which employees make to your organization. This is an area where U.S. organizations do not fare well–although six out of ten employees feel that they are committed to their employers, only half believe the organization is equally committed to them. Do your employees feel that they are cogs in a wheel, easily replaced, or do you demonstrate that they are an integral part of your operation? Quite often, senior management will talk up the value of employees and claim that their contributions are essential but their actions–especially in difficult times–screams cogs. Commitment is a two-way street. There are 4 Cs in the Insightlink model of employee engagement: commitment, communication, culture and compensation. 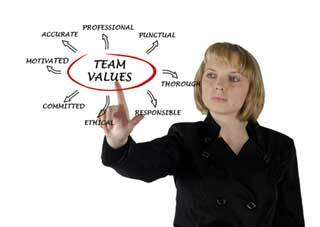 The first of these, commitment, means that if employers want loyal employees, they need to be loyal employers. Unfortunately, many view employees as free agents willing to jump ship for any better offer. Many employers long for the days when productive employees stuck around for their entire careers. Employees, on the other hand, believe that companies do not value loyalty and will sacrifice employees for the bottom line or as fall guy for management. Employees point to downsizing, rightsizing and re-engineering as evidence. Clearly, there are employers who create appealing work environments, and are genuinely committed to helping employees stay, grow, and prosper as the organization succeeds. But it’s a minority of U.S. organizations. To foster fairness, it’s essential to pay competitive wages and benefits, create and implement policies in unbiased way, provide timely, accurate and meaningful performance appraisals, offer all employee opportunities for growth and promote those who are most qualified. It’s alarming that so many employees complain that their organization runs on favoritism. To nurture loyalty and commitment, create an environment of trust. This means stamping out territorial disputes, ensuring that management does what they say they will do, protecting employee confidences, modeling the behavior you want others to display, letting employees have control over how they do their work, allowing them to make mistakes without fear of ridicule, explaining the reasons behind every major decision and honestly acting on employee recommendations. Concern for employees. Be open and honest with employees. Train and develop managers in people skills as well as job skills. Be flexible when issues come up, provide job security and allow them a life outside work.